Just received it, and promptly installed. i'll rate it from 1 lowest to 10 highest. - aesthetically it's a nicely marketed box with graphics and details. easy to know what it is and does. colors are white text, with dark blue and light blue background. as for durability, it's a solid card board box, with foam compartments for the parts. Seems sturdy enough for shipping, but i'd still not try to toss it onto the floor needlessly. - i did read the manual, but in the end it was pretty obvious to me what to do. i simply remove the casing for my ts-877 (had to unscrew before can remove. I was worried about what if i already had a graphics installed, but this part used the other slot which is in the other segmented part of the internal which has the smaller pcie slots separate from the other one used for the graphics. so no problem. had to remove the default slot cover, then insert the wireless adapter module, and screw it back. and lastly, you have to screw on the wires to adapter, and also add the antennas, very simple. just need a screw driver, and to ground yourself before handling electronics. - yes the wireless plate is plastic most part but it has a small weight to it due to the magnet inside. the magnet is quite strong to stick very well to metallic surfaces (i tested ontop of my qnap case). So even if it was upside down, i doubt it would fall down, put it that way. okay the app software tested is wireless ap station and the virtual network (PCIE wireless). it works well. i'm actually going to be testing over a month usage using pure wireless to connect to the QNAP. so i will update wireless app/performance when i sufficiently tested this to have a better idea how i feel about using wireless to the QNAP instead of wired. previously i said that vpn gateway does not work when using wireless. that is incorrect. the only reason it didn't work was due to a misconfiguration on my part. i was supposed to separate the wireless adapter to a different ethernet port from the vpn. so no, the setup is not merely plug and play. you need to also carefully configure the virtual network and pair the wireless adapter to a different unused port to prevent conflicts like the one i discovered. it's a quality hardware wireless adapter that does what it's meant for. If you want good wireless direct to the qnap, or either to offload workload from your existing wireless router, or you don't have existing wireless ap to use already, or you want to relocate your NAS to an area where a wired connection may not be possible. Then yes this is a good item to get. performance can vary depending on your client devices wireless capability, like my own tests demonstrates. but on the qnap side, seems decent enough. Last edited by Moogle Stiltzkin on Sat Oct 20, 2018 7:34 pm, edited 6 times in total. QWA-AC2600-5G could not find the default gateway or the default gateway is WLAN. Last edited by Moogle Stiltzkin on Fri Oct 19, 2018 8:15 pm, edited 1 time in total. if you go to virtual network, it also detects PCIE wireless there as well. but if you use that, you cannot use the wireless ap station unless you disable virtual network wireless setting first. What are your plans for using this card? Mine is on it's way! Back up - Synology -1817+(2x10, 4x6, 2x4) Raid SHR & Drobo 5n - 5x4tb Seagate & Buffalo LinkStation -2x 4TB Seagate = about 150TB all up. TV client boxes - present and past - 2xShield Pro (2015 & 2017), Shield 16gb 2017, ATV4, Xbox 360 & one, FireStick, Fire TV, Roku3, Roku4, Chromecast, Samsung & LG Smart TV's and multiple android phones and tablets. All software is updated as soon as it's available. I give my opinion from my experience! spikemixture wrote: What are your plans for using this card? i won it from the contest. I won one also and I have similar plans as you. I have about 50 things connected to my 2x Asus routers and mesh setup. wow... sounds like you need it much more than i do. with that many devices, yes the wireless ap will definitely help offload the burden on your wireless router. in the youtube i saw it talks about that. if i were to use ap station, then i'd have to connect to the wireless ap (qnap) to access. how to connect to wireless from windows 10? // just an update. i forgot i had disabled the wireless on the desktop pc for starters (since i wasn't using it). You can then right click the internet connectivity icon and it will show the list of available wireless networks there. so fixed that. i'll try setup wireless ap station much later and see if i can directly connect to the qnap without having to go through the router. that would be ideal. also curious what kind of speeds i can get with it. Last edited by Moogle Stiltzkin on Fri Oct 19, 2018 11:52 pm, edited 4 times in total. ugh confused how to get this to work. using virtual network, i manage to connect the QNAP to the router via the wireless PCIE adapter. It says it's connect on qnap side. i also check router, it also says it's connected. So.... my desktop pc which is connected to the same router, is also on the same network. So how do i connect it to the qnap via the wireless? 4. next step is to setup the samba shortcut using the wireless lan ip e.g. QNAP > wireless > router > desktop pc. This is not as beneficial as QNAP > desktop pc (which would require setting the qnap up using the wireless ap station). the only reason i did it the former method is because that just simply worked as it detects the qnap device on the same network and can connect. but if i setup ap station, all devices that want to connect to the qnap have to login direct to it, rather than through the router network. it would seem to me, using the qnap itself as the access point is the optimal solution? further testing, it's better to set the wireless to connect automatically enabled. (helps a lot during reboots). You can disable the connect auto, only if you plan to go wired permanently thereafter. qfinder works for wireless. it even tags it as (wireless) to indicate that is how it is connected to the network. Last edited by Moogle Stiltzkin on Sat Oct 20, 2018 12:40 am, edited 4 times in total. ok after more troubleshooting, i managed to resolve some of my technical troubles by rebooting the qnap, my desktop pc and router. everything seems to work fine at this point. i check qnap log and it showed ip for desktop pc got permanently banned (although it doesn't get added since it has allow all ips set). anyway that is probably why the networking was acting up a bit. anyway got that sorted. added a windows credential for the wireless adapter ip (already set a dhcp for it, so it doesn't randomly change each time). i can connect to it like i normally do on wired. on wired i can get max 110-120 for both ul and dl, so..... wireless is not as good as wired in that sense. i'll just stay using wireless for a month or so and see how it goes. there is no option for WPA3. although to be fair, that is barely out the door yet. even my existing router does not have this option either. but hopefully in future, WPA3 support is added at some point. well i could relocate my NAS away from my router and switch, and put it next to my HDTV and plug in the HDMI. Then can actively use the hdstation to use kodi. 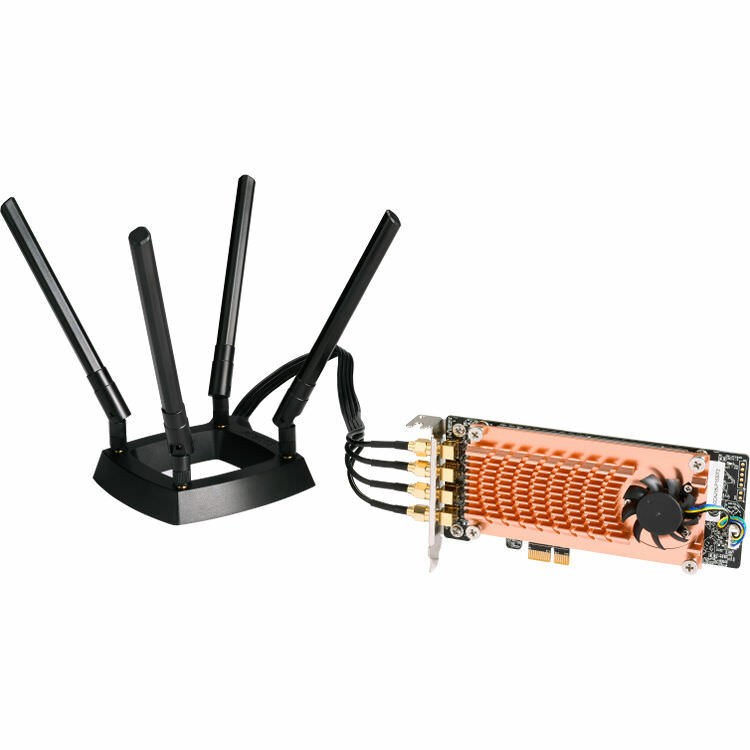 the wireless adapter also says it can be installed on your desktop pc. but the caveat is, you need either ubuntu/linux system. but... i use windows 10..... so.... >_>: hm.... any possibility for usage in a win10 system? Moogle Stiltzkin wrote: any possibility for usage in a win10 system?